Happy Release Day! Sing along with me, will you? 🙂 It’s a strange sensation, not just because I think it’s a bit of a dirty word, this whole “release day” thingy. It’s just strange that we make such a big fuzz about something as simple as a new book in a bookstore. Yeah, I know, it’s all about marketing, PR, drumming up excitement, selling and what not. On the other hand, release day also means that I, the author, have to let go, physically release my characters and their adventures into the freedom they deserve. No to release days are alike. I’ve been up two hours, so it’s still early, but I can already feel that it’s going to be different, for more than one reason. First, I’m not as nervous as I used to be. And it’s not just the fact that, by now, I’m used to releasing books. It is, after all, my fifteenth book, my twelfth novel. There’s a different reason. I feel I’m done somehow. Difficult to put my finger on it, but I don’t see another novel in the near future, not from me anyway. I’m smarter than saying “never”, I won’t, but for now, I think I’m done. I want to do something else. What? We’ll see. A day job, some hard-earned money would be nice. It’s been a while. Let’s not dwell too long on me, I’m irrelevant. Let’s focus on the book. While it’s “happy release day to me”, it’s really all about the story, the characters, and I think Martin’s story deserves telling, it deserves reading. It highlights a generation of gay men that we don’t read much about. They are the ones who fought for the freedoms we enjoy today, they were at the forefront of the LGBT organizations in the sixties and onward, the ones threatened to their lives. Martin may not have been on the barricades, for many reasons. Instead, Martin’s story is the one of why the struggle for equality and inclusion is so important. No, writing about Korea wasn’t part of some grand scheme of mine, despite how “in” Korea seems to be right now. It’s one of the longest wards in human history, still ongoing, with a very long cease-fire. And even though we’ve seen some tiny steps (as we have in the past) toward a detente on the peninsula recently (all happening after I had traveled to Korea for research in January), events in recent days show just how fragile progress is, and how easy it is for North Korea to retreat and clam up again. Given the American regime’s split tongue messages, I can’t really blame them. Who would want to end up like Ghaddafi? Deserved or not, Kim isn’t that stupid. Stay tuned to see this unfold in the coming weeks and months. Or not. The reason why Korea became a topic was simple: given Martin’s age and the fact that he was conscripted into the armed forces, Korea was the logical choice. It was the big conflict the US was involved in at the time. I just hadn’t really done my homework and needed to do a lot more homework than I could’ve bargained for… All good though, it’s a much better story for it. My books span across many genres, including erotica and science-fiction. Then I write YA and contemporary, family sagas and dark stories about child abuse. What are the things that bind all those books together? Two things: they are all about gay fiction (which incidentally is not the same thing as M/M romance, I feel the need to point this out, since some people seem to believe that) and they all leave you with feeling good at the end. Here in Sweden, we have a genre called “feelgood” which is odd, an English term in Swedish, but it is what it is. I’ve made it my own because it helps me to accurately describe what my stories are about. Like an elevator pitch. 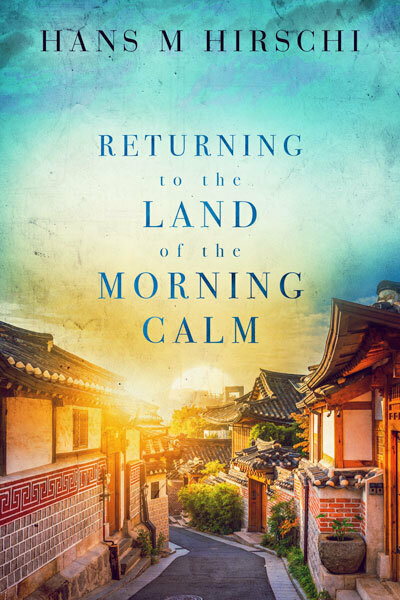 Returning to the Land of the Morning Calm is a good example of that. I invite you to get to know Martin, Ji-Hoon, Kevin, and Eugene. You can learn more on the book’s own page here, with a trailer, buy links and a short narration of the first chapter.